Throughout June, Signature HealthCARE locations are encouraging residents to raise their voices and to share the importance of their vote. 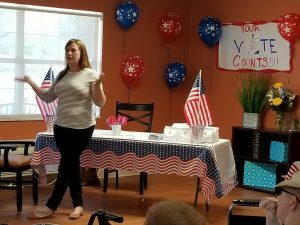 At Signature HealthCARE of Coshocton, Pastor Ross spoke on Flag Day about Betsy Ross, and later in the day, we were joined by Kristen Ross of the Board of Elections. Thank you for empowering our residents and stakeholders on how to find if you are a valid voter and how to receive absenteeism ballots.